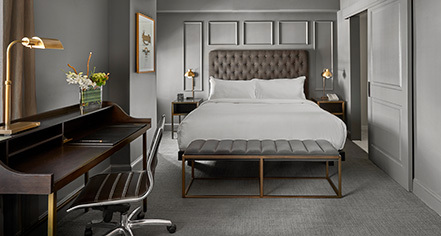 Guests at the Hotel Phillips Kansas City, Curio Collection by Hilton can sleep well in a newly restored guestroom with plush bedding and blackout curtains. 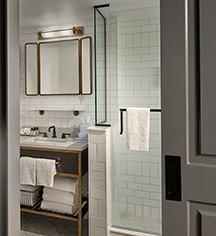 Enjoy 1930s charm and modern amenities, including a farmhouse-style bath door, complimentary WiFi, a flat screen television, ergonomic workspace, premium cable, sitting chair, and Keurig coffee maker. Refresh in the bath with make-up lights and C.O. Bigelow bath products.